The Indian retail sector has been at the helm of India’s growth story. It has caught the world’s imagination in the last few years and is topping the list as one of the most attractive retail estinations in the globe. It is one of the top five largest retail markets in the world at around US$ 450 billion by economic value. India is one of the fastest growing retail markets in the world and accounts for 14 to 15 percent of its GDP. It has an annual growth rate of approximately 15%. International retail giants like Wal-Mart, Carrefour and Tesco are looking for potential partners to enter the vast Indian retail market. India’s robust macro-and microeconomic fundamentals, such as robust GDP growth, higher incomes,increasing personal consumption, favorable demographics and supportive government policies, will further accelerate the growth of the retail sector. Although the growth potential in the sector is immense, it is not without challenges that could slow the pace of growth for new entrants. Rigid regulations, real estate costs, high personnel costs, lack of basic infrastructure, shrinkage,and highly competitive domestic retailer groups are some such challenges. Additionally, resource constraints at shopping mall projects are also delaying completion and disrupting many retailers’ entry strategies. As we see the retail sector has a considerable impact on the overall economy of the country. And this is where technology fits in. Integration of the various business functions is an essential prerequisite for synchronization among the different business activities involved in a retail business. A number of retailers integrate their core business activities by using packaged software suites or fragmented legacy software applications which result in lower levels of effectiveness and efficiency. Major problem in this is high maintenance costs, integration and scalability and increased risk to the business. So there is need of such a product which will make these core business activities easy and as centralized as possible. The solution lies in a web-based retail ERP. Technology has provided a new dimension in the retailing industry. The introduction of point of sale equipment, bar codes and huge storage capacity for billing and payment database has facilitated the management of large set-ups with ease. Operations can be recorded systematically and in a structured manner, providing detailed analysis of the sales and volume of transactions. Volume of sales due to electronic transactions have increased the in the country. Technology has also introduced flexibility in the mode of payment like cashless transactions, which in turn has helped in driving sales. The introduction of new technology may be intricate for retailers, but the convenience and cost effectiveness create the need for new advancements. Large stores need to monitor inventories and expenses of establishments. With automated machines and high-end computers making calculations and managing task simpler, the focus of retailers can stay on retaining customers with new strategies. The need for such technological advancements has been acknowledged in India. The point of sale (POS) applications will provide for quicker consumer check-out and multiple payment options like credit cards. Solutions ranging from simple Point of Sale (POS) systems to complex retail ERPs have been implemented mainly by large, mid-sized and manufacturer-retailers in India. Using ERP packages and solutions like Retail Pro,higher-end solutions like JDA, SAP IS Retail or Retek facilitate backend operations. Along with business optimization software, mobile computing and B2C concept assist retailers to cut cost and increase efficiency, but these solutions don’t come cheap and are mainly targeted at big retail stores with chains in India. The emphases of retailers are now in utilizing IT solutions like CRM and ERP to carry out the behavioral analysis to stay in the competitive market. But it is expected that the demand and utilization of these packages will grow in the near future. This clearly is an indication of technology serving as an effective means to build the retail business and not just restricted to supporting and improving the operational efficiency. Though these solutions have been implemented, returns on these investments take a longer period.Retail ERP packages have been implemented by large retailers but today they are experiencing difficulty in utilizing it fully, one of the key reasons could be the lack of adequate training. Many retailers in India have decided to adopt one or another enterprise resource planning (ERP) system to improve their businesses, but implementing an ERP system can be a demanding venture. ERP implementation has always been an intricate process and is one of the challenges of the retail sector.There have been many obstacles seen in implementing ERP successfully. According to Standish Group’sreport, around 75 per cent of the ERP projects are classified as failures. 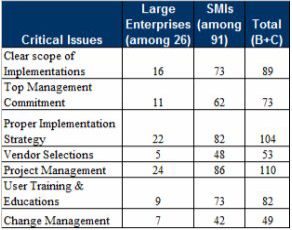 Some of the corereasons identified for the above are that a number of retailers integrate their core business activities by using packaged software suites or fragmented legacy software applications which result in lower levels of effectiveness and efficiency. Major problem in this is high maintenance costs, integration and scalability and increased risk to the business. The majority of the problem arises out of implementation/commitment or lack of education/training about ERP. A simple solution to this problem was a learn-while-use ERP which would not require for the end-user to take a separate training for using the ERP. This way the customers can be self-dependent and would eventually start using the product. A better market analysis and thorough research helped us to design a solution for the automating the business process in the retail industry. The environment for RujulERP would be more user friendly than others so that the user himself can train him on the product. Implementation planning should begin with industry selection. Implementing an ERP package is a complex and costly undertaking, so it’s essential to choose the appropriate business or industry. That is the reason why we are concentrating on a single industry. Team composition includes the best and the brightest individuals from each functional area of the company. These individuals understand the inner workings of their respective business processes thoroughly. As the retail industry becomes more and more intense and competitive, retailers and businesses will not indulge in the complexities of managing inventories and figuring out sales graphs, but will focus on retaining customers and building new strategies. By building a custom software system specific to the retail industry which is supposed to automate the concept of enterprise planning for the complex business system. To build a configurable and generic platform to allow the user to represent or model every possible business component and business process in the industry. Keep all business activities centralized. RnR came up with the view that these three concepts would help in building a comprehensive ERP solution suited to the retail industry. The company then reviewed the pros and cons of the already available successful ERP systems in the industry and decided to study the various business components and processes of the retail industry in detail. Another important decision taken in designing the solution was that the product should be highly robust and flexible using which a person can represent every structural and behavioral process of their business just by configuring the product while the system then provide the necessary interface needed to implement the same along with other non-functional behaviors that are expected by the user. RujulERP is to be designed as a versatile web-based ERP solution which can be used from small sized stores to very large sized retail industries. It will support real time conversion of different currencies which is going to help companies manage their clients and suppliers from across the border. Bank Reconciliation tasks will also be taken care by the application. It will help you analyze your data with the help of many interactive dashboards provided module-wise. RujulERP separates bulk sale (wholesale) and retail sale, which will enable large sized distributors to bulk sale their products, instead of going for a POS.